This is victory Kwan Kung on Horse, riding towards fame. 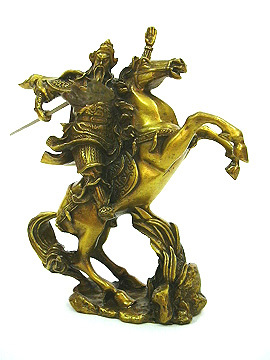 The figurine is made of high quality bronze depicting him wearing his war robes and holding his "Kwan Dao" confidently. Such position and profile of the Kwan Kung is victorious for business pursuits, politicians, protection against evil forces, wealth luck, energizing family achievements, activating more helpful people and countering ill effects of bad stars. The figurine is suitable for placement in homes and business premises. The Kwan Kung usually wears his military uniform with embroidery of the powerful Dragons. Kwan Kung has a red face as his famous identity, always look confident, usually victorious and normally fierce to scare away the evil spirits and opponents. His most powerful weapon is the "Kwan Dao" (the battle knife), a special knife in which only the Kwan Kung used and no one else. 3. At work, place the Kwan Kung image behind where you sit at work for retention of power and status. This position is most suitable for managers, leaders, executives and politicians. For employees of big firms, the powerful protector on your desk or behind you will keep away backstabbers and deceivers. However, for the case of the Kwan Kung riding on a horse, one must never display such kind of image behind them to prevent the horse from accidentally prancing on them. Instead, they could place it diagonally at one corner and not direction at the back.